Our TV’s, radios, and mailboxes are being inundated with lies and smears against Democrats. Who’s “the architect” of this effort? Karl Rove. 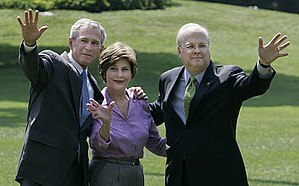 Karl Rove stole the White House for George Bush in 2000 by getting 5 Republicans on the Supreme Court to throw out 175,000 votes and appoint Bush. He stole Congress for Republicans in 2002 by forcing a divisive vote for invading Iraq based on his WMD lies. He stole the White House for Bush again in 2004 through phony terror alerts and the Swift Boatsmears against war hero John Kerry. He vigorously defends other corporate slush funds like the Chamber of Commerce. In many states, early voting has begun so you don’t have to wait for Election Day. After you vote, you can zap political ads, throw out political mail, and spend your free time telling friends and strangers to vote straight Democratic. This will be good for America, good for your mental health, and good for your soul.